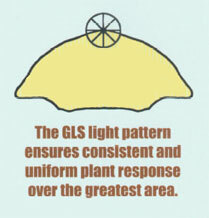 At nearly 90% efficiency, the GLS is delivering more usable light energy than any other reflector in the industry. This stellar performance allows greenhouse growers to significantly reduce the number of fixtures needed for growing success. Ideal for low clearance situations. Accepts 400, 430, and 600 watt HPS. Protective lens option helps keep bulb and reflective surfaces clean. MIRO 5 aluminum construction - the highest reflectivity available - delivers broad, even coverage from a minimal fixture footprint. Reflector Size: 14.5"L x 12"W x 5.25"
High Pressure Sodium offers a light that is more in the yellow and red color specturm. This type of light is best used in conjunction with natural sunlight (or metal halide light). It works best promoting fruiting and flowering in plants. Advantage: Usually last twice as long as MH and have more light output per watt. Metal Halide offers a light that is more in the blue color specturm. This type of light is most like natural sunlight, and is the best as a primary light source where little or no light is available. Promotes plant growth and is more appealing to look at. Advantage: Less expensive than HPS and does not require additional light sources for optimum performance. Greenhouse Megastore is pleased to offer free layout and design services for Large Grow Lighting Applications. Fill it out, and fax, email, or mail it to us. We will follow-up with a layout configuration and quote that is optimal for your specific needs.